I know I leave myself open to accusations of hubris in claiming this recipe as a ‘classic’ Tiramisu. 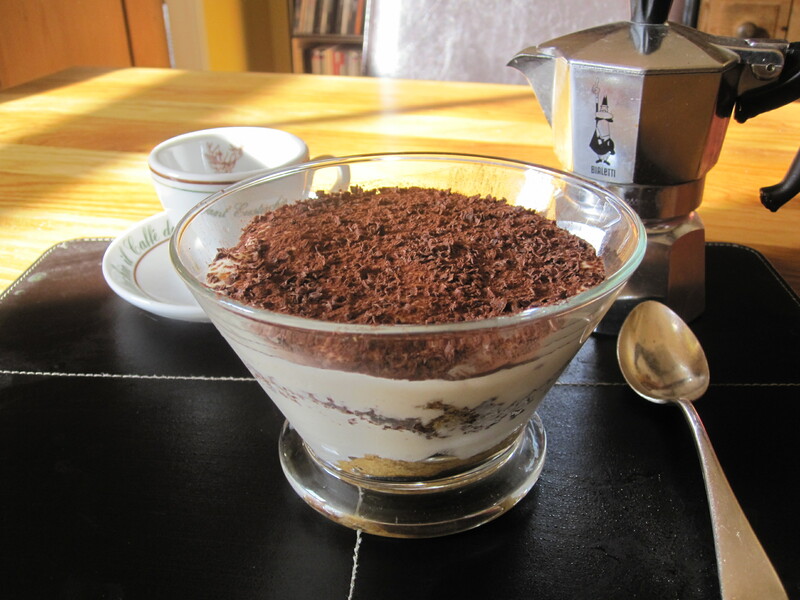 But writing about my own favourite recipe on the blog is as much a reaction against the many bad – even terrible – Tiramisus found in restaurants as wanting to share one I consider both authentic and absolutely wonderful. I used to be an enthusiastic dessert cook and when anyone came for a meal I would often make two or more puddings. Nowadays my tastes have changed and I avoid anything very sweet or moulded with vast quantities of whipped cream; if I make a pudding it’s most likely to be a fruit tart or crumble on a Sunday evening if family come, or the infamous family celebration ‘cake’ – Torta Caprese for other guests, usually with a fresh fruit salad made with blueberries and raspberries on the side. I even rarely eat desserts in restaurants, unless it’s a special outing, like to A Cena and Caldesi in Campagna recently. These are two places where I would without hesitation order a Tiramisu but in most other places I avoid it. Too often it comes with huge quantities of whipped cream added; too much strong liqueur; or swimming in a sea of over-sweet chocolate caramel sauce – most likely squeezed from a bottle. The origins of Tiramisu are often the subject of culinary debate. There’s little doubt it comes from Italy but the exact region is less certain, though the general consensus traces its roots to the Veneto and thus it is a typical dish of Venice. My favourite recipe for years has been Antonio Carluccio’s in My Favourite Italian Recipes and I’ve faithfully followed this without deviation till recently. However, I have started adding in a little grated dark chocolate between layers a la Delia Smith (her recipe is almost exactly the same as Carluccio’s apart from this addition) … because my love of desserts may have wavered over the years but my addiction to chocolate hasn’t! And the marriage of chocolate and coffee is surely one of the best one can enjoy. Tiramisu means literally, ‘pick me up’, and with its powerful, rich flavours and strong coffee, it will certainly give you a wonderful kick at the end of a meal. 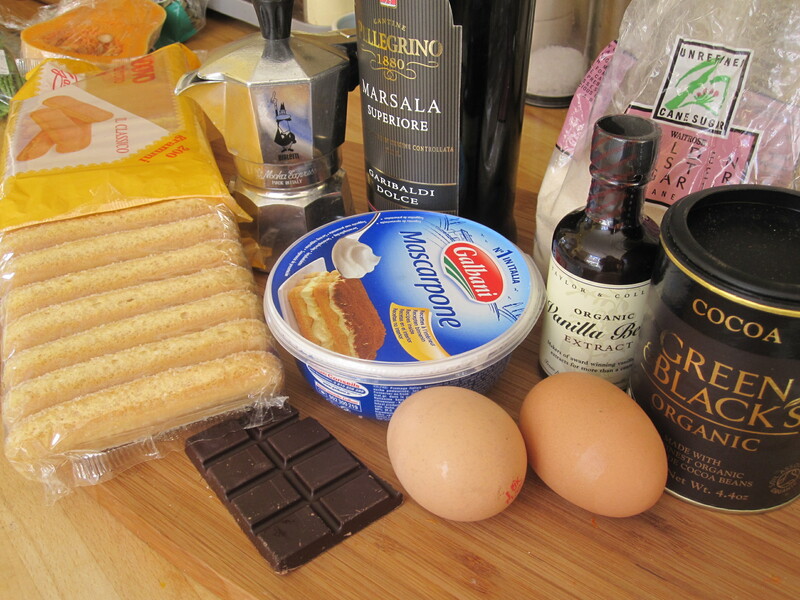 I experienced a poor Tiramisu in a chain restaurant last weekend (having obviously forgotten my vow to not eat it in such establishments) and thus, with my son and daughter-in-law coming for supper tonight and willing sharers of the dish, it seemed a good time to add my tiramisu recipe to the blog. First of all make some strong espresso coffee – you’ll need 180ml (6 fl oz). Pour it into a shallow bowl and when it’s cool add 4 tablespoons of Marsala wine. 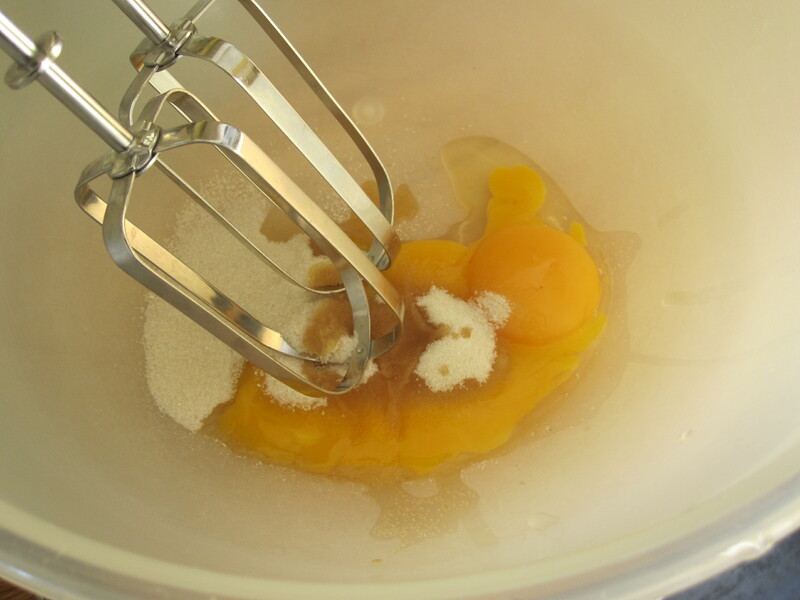 Put 3 egg yolks in a large mixing bowl with 3 tablespoons caster sugar, and 1 teaspoon vanilla extract. Beat it all together until a thick, pale cream is formed. Then add in 1 tub (250g) mascarpone cheese and beat together till smooth. 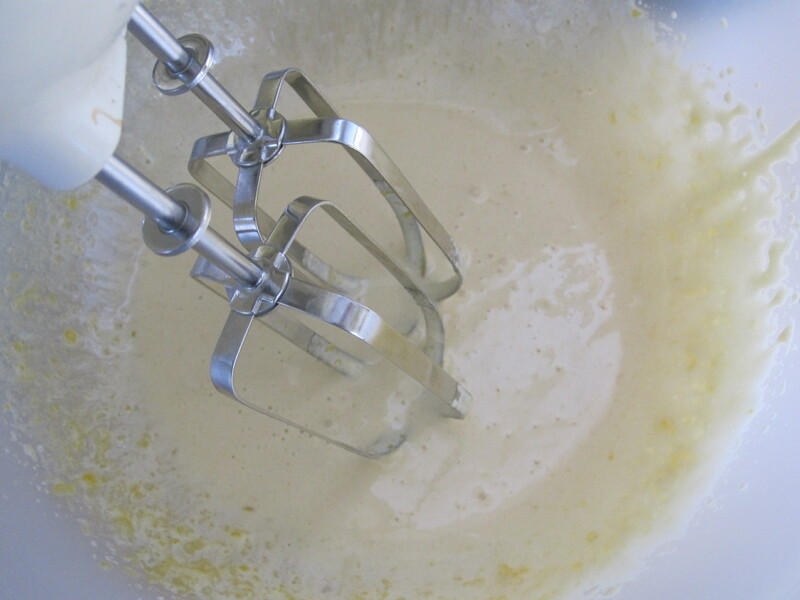 In another bowl whip 2 egg whites until stiff and then very gently fold into the creamy mixture. Coarsely grate a few squares of plain dark chocolate onto a saucer. Now you’re ready to start putting it all together. You can either make the Tiramisu in one large bowl, as I sometimes do, especially for parties, or make up small individual ones as I’ve done today. Have ready 12 Savoiardi (lady’s fingers) biscuits and your bowl – or bowls – to hand. Dip 2 biscuits in the coffee and Masala mix; just long enough for them to soak up a bit of the mixture but not so they disintegrate. Now put them in the bottom of the bowl, breaking in half if using small bowls. Continue doing this, just 2 biscuits at a time, until each bowl has a single layer. 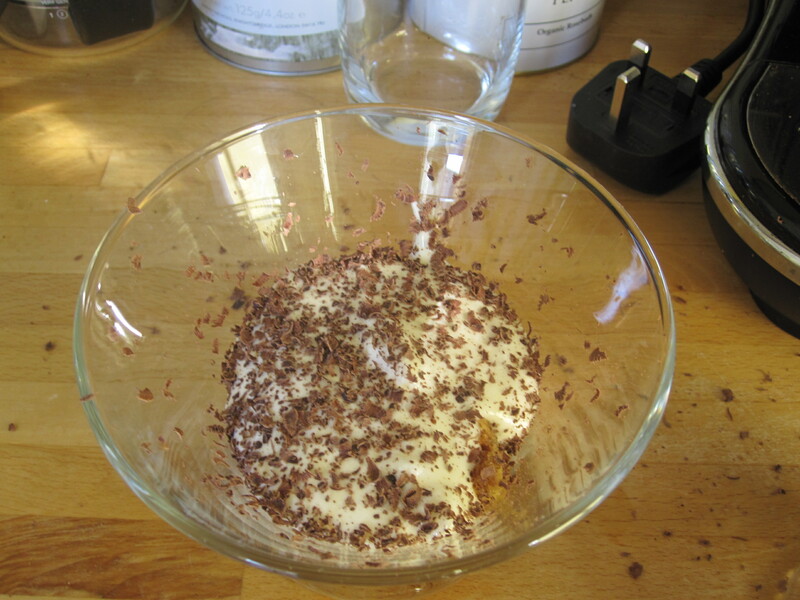 Then spoon over some of the mascarpone cheese mixture and sprinkle over some of the grated chocolate. 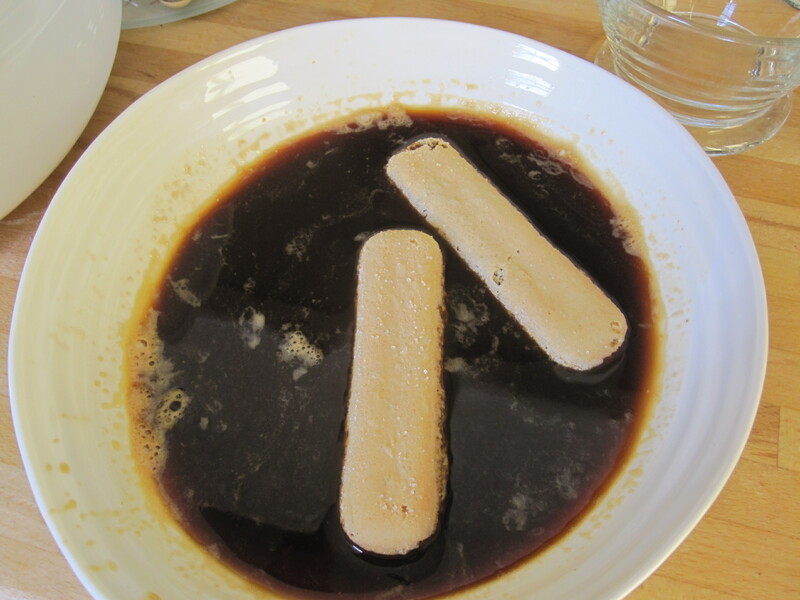 Now add a second layer of coffee-soaked biscuits till they are all used up. Then share the rest of the creamy mixture between the bowls and finish off with a little more grated chocolate sprinkled over the top and a dusting of cocoa powder. 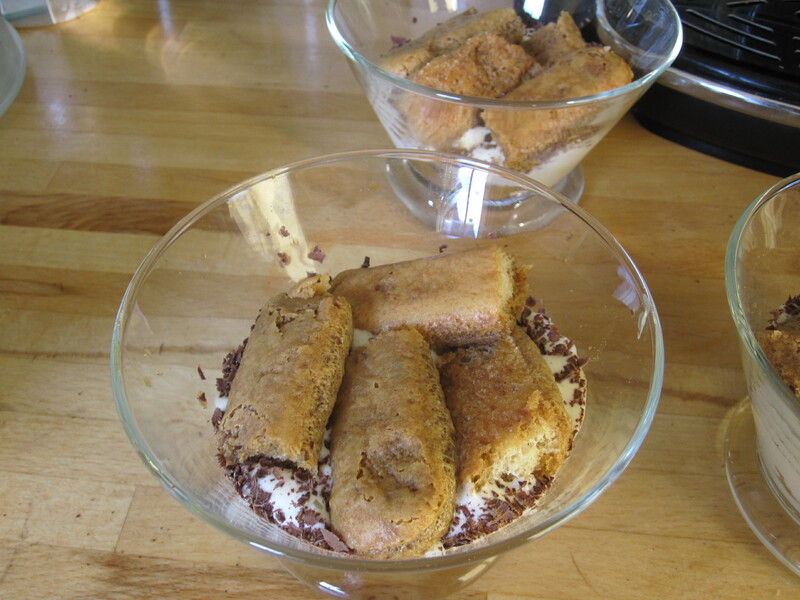 Cover your Tiramisu(s) with some cling film and put in the fridge to chill for at least an hour before serving. Recipes become ‘classics’ for a good reason: because they are exceptionally good and this really is one of my favourite desserts and a fantastic treat.